A recent report published by Infinium Global Research on luxury goods market provides in depth analysis of segments and sub-segments in global as well as regional luxury goods market. The study also highlights the impact of drivers, restraints and macro indicators on the global and regional luxury goods market over the short term as well as long term. The report is a comprehensive presentation of trends, forecast and dollar values of global luxury goods market. According to report the global luxury goods market is projected to grow at a CAGR of 2.9% over the forecast period of 2018-2024. The word "luxury" originated from the Latin word “Luxus,” that means indulgence of the senses, regardless of the cost. A luxury good is a good for which demand increases more than proportionally as income rises, and is a contrast to a "necessity good", where demand increases proportionally less than income. Luxury goods are often used synonymously with superior goods and Veblen goods. 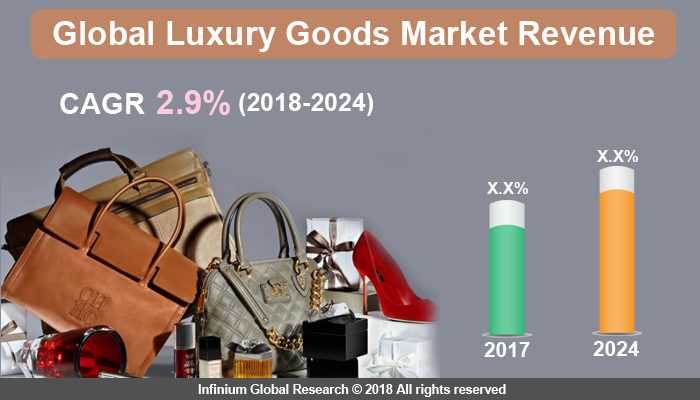 Luxury goods market includes apparel and leather goods, luxury watches and jewelry, personal care products and cosmetics, wines/champagne and spirits, fragrance and perfumes, and others. The global luxury goods market is growing due to the rising number of high net worth individuals (HNIs) in every nation, and increasing disposable income among the growing middle-class population. New consumers are getting lots of media exposure about several luxurious product through picture, internet, print media and other sources. They are craving those product and finally they are buying to boost their image in society. Additionally, increasing spending on the luxury products improves the living standard of rich persons. It also provides satisfaction to them and provides chances to boost their richness to other people. There are several factors which are helping to boost the market as growing industrialization, increasing disposable income among neo-rich and middle-class people. Further, the growth of financial organizations which are financing the modern luxuries goods, and charging minimal interest rate or virtually nothing to attract lots of consumers towards them is helping to boost the market exponentially. The rise in corporate culture, which is promoting nuclear families, who are extra cash rich are getting lots of exposure to luxury goods are craving to purchase those products to increase their societal status. In addition, the rising number of organized retail and wholesale stores and financing facilities offered by them are helping to boost the market globally. However, uncertain economic situations are some of the major factors that could hamper the market growth. The 2007-2009 economic slowdown had a negative effect on the sales of luxury goods, globally. Currency fluctuations and less number of brand outlets in developing regions could be the market restraining factors. Growing capitalization, increasing disposable income of middle-class people in the developed and developing countries, the keen focus of manufacturers and advertising firms are expected to boost the demand of luxurious items in the medium and long run. Europe dominates the global market for luxury goods and is followed by North America. It is expected that during the forecasted period Europe will maintain its dominance in this market. As Europe is considered one of the best market for costly fashion and luxury brands items, due to the fondness of European people towards luxury goods and precious items. In addition, the rising number of high-end departmental stores and increasing use of online stores within Europe will further benefit the market to gain traction. Additionally, Asia Pacific’s luxury goods market is growing at the highest CAGR, due to the growing number of neo-rich, increasing disposable income among middle-class consumers, the growth of financial services. Additionally, several luxury brands companies are approaching towards Asia-Pacific due to low manufacturing cost, and growing market of luxuries items are helping to boost the market. Further, advertisement companies are targeting these middle-class people for their luxurious products, which is inducing the demand for luxury goods in these regions. The report on global luxury goods market covers segments such as, product type and mode of sale. On the basis of product type the global luxury goods market is categorized into designer apparel & footwear, jewelry, accessories, cosmetics & beauty products, fine wines/champagne & spirits, travel goods and others. On the basis of mode of sale the global luxury goods market is categorized into retail and online. The report provides profiles of the companies in the global luxury goods market such as, The Estee Lauder Companies Inc., LOral International, LVMH Group, Kering SA, The Shiseido Company, Ltd., Prada S.p.A., Ralph Lauren Corporation, Swatch Group, Luxottica Group S.p.A and Compagnie Financire Richemont SA. The report provides deep insights on demand forecasts, market trends and micro and macro indicators. In addition, this report provides insights on the factors that are driving and restraining the global luxury goods market. Moreover, IGR-Growth Matrix analysis given in the report brings an insight on the investment areas that existing or new market players can consider. The report provides insights into the market using analytical tools such as Porter's five forces analysis and DRO analysis of luxury goods market. Moreover, the study highlights current market trends and provides forecast from 2018-2024. We also have highlighted future trends in the luxury goods market that will impact the demand during the forecast period. Moreover, the competitive analysis given in each regional market brings an insight on the market share of the leading players. This report will help manufacturers, suppliers and distributors of the luxury goods market to understand the present and future trends in this market and formulate their strategies accordingly.